The week-by-week training tracker for charting bodybuilding success. Large-format —8 x 10 inches. Smart program design and meticulous record keeping. 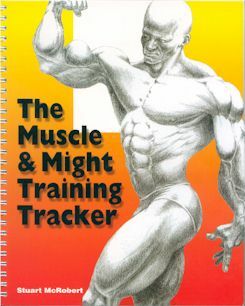 When used as advised, this training logbook (or training diary) will help you to satisfy all five of these critical requirements, and keep you on track for achieving your full potential for muscle and might. This 136-page TRAINING TRACKER contains everything you need to track your progress — day by day, week by week, month by month, year by year. A training journal is indispensable for keeping you on track for training success. No matter where you are now — 180-pound squat or 500, 13-inch arms or 17, 135-pound bench press or 350 — the systematic organization and focus upon achieving goals that a training journal enforces, will help you to improve your physique steadily and consistently. While most trainees are aware of the potential value of a training log, few actually keep one; and that’s one of the major reasons why they make minimal or no progress. There are sample filled-out log pages, and then many detailed blank log pages. The pages track not only the specifics of your weight training — exercises, set-up details, sets and reps, poundages, and a comments area for each workout — but also nutrition, sleep, and body composition. As simple as it is to use a training log, don’t underestimate the critical role it can play in helping you to maximize your training productivity. One training log will track your progress for at least 24 months. And this log is built for the job it’s designed to do. For example, its robust paper provides the strength to withstand heavy use, and the spiral binding enables the book to open flat for ease of use when entering data. This is no ordinary training diary. At only $19.95 per copy, plus p&h, you get 24 months of the tracking needed to keep your training and recovery bang on course. That’s just $1.00 a month. The training journal also provides a summary of exercise program design, and many training tips. The journal is much more than simply a book for logging workouts. It’s a key to great results. If you are serious about making your training work, you need to get serious about keeping a decent training log. The TRAINING TRACKER makes it easy for you. As Stuart says, “get each day right” and the best way to do this is to keep track of what you do each day, and especially what you do in the gym. Proper use of the TRAINING TRACKER will boost your progress.